“Hourly” menu displays hourly stats for all your trades arranged in 24 columns, one for each hour and an additional summary column. Current hour is marked with grey color and bolded text. Stats get recalculated every minute (calculation is triggered by pseudo-cron) and therefore always display your traffic trading for the last 24 hours. 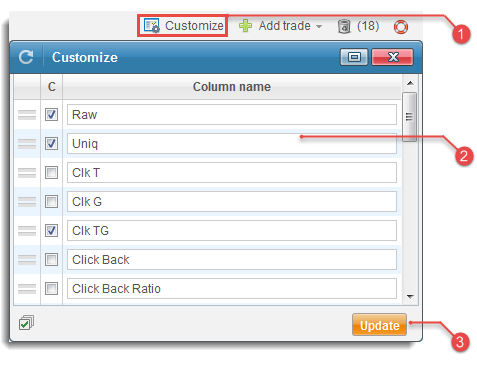 Toolbar contains links to total summary stats, a Select trade button (opens a drop down list of all you trades), a Niches button (opens a “Niches groups” drop down menu), a Customize button (you can completely customize “Hourly” Interface, include various parameters and change column order), an Add trade button (opens an “Add trade” drop down menu) and a Trash button (opens “Trash” window). Help button will load related information in our User manual. You can edit single trades and inspect their graphs using Edit and Graph icons in the “action” column. Click Customize button on the right side of the toolbar to open “Customize” window. - reposition all parameters - drag them up and down and change column order. - rename the enabled parameters - to view original column name, hold mouse over the input field and it will appear in the tooltip. Click button at the bottom of the window to save your preferred settings.